As a result of this configuration, users see a default label applied when they create a new document or email. However, they are prompted to apply the new label when credit card information is detected. When the new label is applied, the content is reclassified and protected, with a corresponding footer and watermark. You can finish this tutorial in about 15 minutes. A subscription that includes Azure Information Protection Plan 2. If you don't have a subscription that includes Azure Information Protection Plan 2, you can create a free account for your organization. You've added the Azure Information Protection blade to the Azure portal, and confirmed that the protection service is activated. The Azure Information Protection client is installed on your computer. To install the client, go to the Microsoft download center and download AzInfoProtection.exe from the Azure Information Protection page. Office apps minimum version 1805, build 9330.2078 from Office 365 Business or Microsoft 365 Business when you are assigned a license for Azure Rights Management (also known as Azure Information Protection for Office 365). Office Professional Plus 2013 with Service Pack 1. Office Professional Plus 2010 with Service Pack 2. For a full list of prerequisites to use Azure Information Protection, see Requirements for Azure Information Protection. Using the Azure portal, we'll first change a couple of policy settings, and then create a new label. Open a new browser window and sign in to the Azure portal as a global admin. Then navigate to Azure Information Protection. Select Classifications > Policies > Global to open the Policy: Global blade. Locate the policy settings after the labels, in the Configure settings to display and apply on Information Protection end users section. We'll use these policy settings later in the tutorial when you will see them in action. For Select the default label, select General. If you don't have this label because you have an older version of the policy, choose Internal as the equivalent label. For Users must provide justification to set a lower classification label, remove a label, or remove protection, set this option to On if it is not already. In addition, make sure that Display the Information Protection bar in Office apps is set to On. Select Save on this Policy: Global blade, and if you're prompted to confirm your action, select OK. Close this blade. We'll now create a new sublabel for Confidential. From the Classifications > Labels menu option: Right-click the Confidential label, and select Add a sub-label. If you don't have a label named Confidential, you can select another label or you can create a new label instead and still follow the tutorial with minor differences. On the Sub-label blade, specify the label name of Finance and add the following description: Confidential data that contains financial information that is restricted to employees only. This text describes how the selected label is intended to be used and it's visible to users as a tooltip, to help them decide which label to select. On the Protection blade, make sure that Azure (cloud key) is selected. This option uses the Azure Rights Management service to protect documents and emails. Also make sure that the Set Permissions option is selected. Then select Add permissions. This option automatically selects all the users in your organization who can be granted permissions. However, you can see from the other options that you could browse and search for groups or users from your tenant. Or, when you select the Enter details option, you can specify individual email addresses or even all users from another organization. You can select different permission levels or specify individual usage rights by using the Custom option. But for this tutorial, keep the Reviewer option. 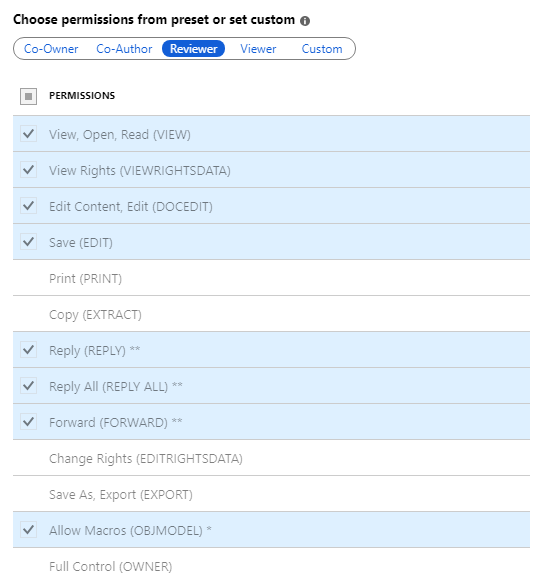 You can experiment with different permissions later and read how they restrict what the specified users can do with the protected document or email. If you select Add permissions, this action opens the Add permissions blade again, so that you can add more users and grant them different permissions. For example, grant just view access for a specific group. But for this tutorial, we'll keep with one set of permissions for all users. Review and keep the defaults for content expiration and offline access, and then click OK to save and close this Protection blade. For the Documents with this label have a footer setting, click On, and then for the Text box, type Classified as Confidential. Although you can change the appearance for these visual markers, we'll leave these settings at the defaults for now. a. Choose the type of condition: Keep the default of Information Types. b. For Choose an industry: Keep the default of All. c. In the Select information types search box: Type credit card number. Then, from the search results, select Credit Card Number. d. Minimum number of occurrences: Keep the default of 1.
e. Count occurrences with unique values only: Keep the default of Off. Click Save to return to the Sub-label blade. For Select how this label is applied: Keep the default of Recommended, and don't change the default policy tip. In the Add notes for administrator use box, type For testing purposes only. Click Save on this Sub-label blade. If you're prompted to confirm, click OK. The new label is created and saved, but not yet added to a policy. From the Classifications > Policies menu option: Select Global again, and then select the Add or remove labels link after the labels. From the Policy: Add or remove labels blade, select the label that you've just created, the sublabel named Finance, and click OK.
Click Save on this Policy: Global blade. If you're prompted to confirm this action, click OK.
You can either close the Azure portal, or leave it open to try additional configuration options after you've finished this tutorial. You're ready to try out the results of your changes. The policy changes you made and the new label you created applies to Word, Excel, PowerPoint, and Outlook. But for this tutorial, we'll use Word to see them in action. On the Home tab, a Protection group, with a button named Protect. Click Protect > Help and Feedback, and in the Microsoft Azure Information Protection dialog box, confirm your client status. It should display Connected as and your user name. In addition, you should also see a recent time and date for the last connection and when the Information Protection policy was downloaded. Verify that your displayed user name is correct for your tenant. A new bar under the ribbon; the Information Protection bar. It displays the title of Sensitivity, and the labels that we saw in the Azure portal. This action displays the available labels again. Select The previous label no longer applies, and click Confirm. The Sensitivity value changes to Personal and the other labels are hidden again. This time when you're prompted, type "This document doesn't need classifying", and click Confirm. You see the Sensitivity value display Not set, which is what users see initially for new documents if you don't set a default label as a policy setting. In the Word document, type a valid credit card number, for example: 4242-4242-4242-4242. Save the document locally, with any file name. You now see a prompt to apply the label that you configured for protection when credit card numbers are detected. If we didn't agree with the recommendation, our policy setting lets us reject it, by selecting Dismiss. Giving a recommendation but letting a user override it helps to reduce false positives when you're using automatic classification. For this tutorial, click Change now. In addition to the document now showing that our configured label is applied (for example, Confidential \ Finance), you immediately see the watermark of your organization name across the page, and the footer of Classified as Confidential is also applied. The document is also protected with the permissions that you specified for this label. You can confirm that the document is protected by clicking the File tab and view the information for Protect Document. You see that the document is protected by Confidential \ Finance and the label description. Because of the protection configuration of the label, only employees can open the document and some actions are restricted for them. For example, because they don't have the Print and the Copy and extract content permissions, they can't print the document or copy from it. Such restrictions help to prevent data loss. As the owner of the document, you can print it and copy from it. However, if you email the document to another user in your organization, they cannot do these actions. You can now close this document. Return the policy settings to their original values that you took a note of, and then select Save. 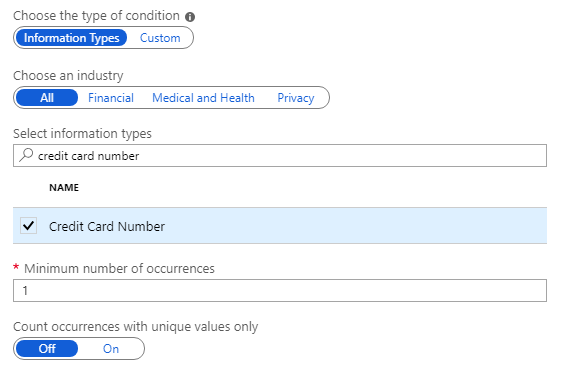 From the Classifications > Label menu option: On the Azure Information Protection - Label blade, select the context menu (...) for the Finance label you created. Select Delete this label and if you're asked to confirm, select OK. Restart Word to download these changes. For more information about editing the Azure Information Protection policy, see Configuring Azure Information Protection policy. 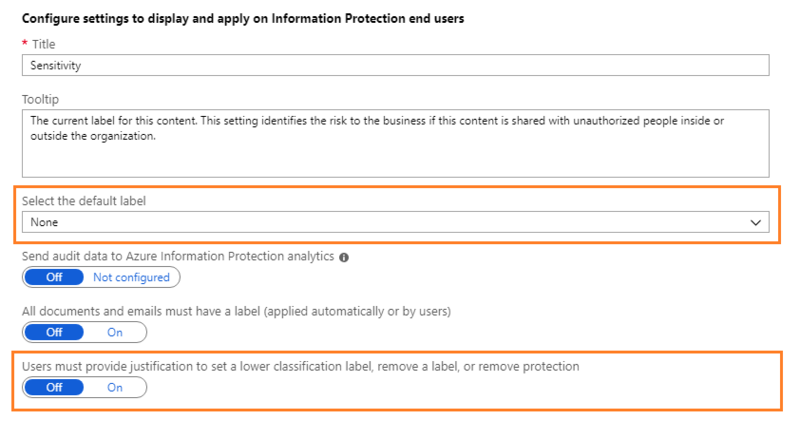 For more information about where the labeling activity is logged, see Usage logging for the Azure Information Protection client.